I always forget this, so I’m posting this here for the next time I need to review a Dell Dset report, that the default password is ‘dell’. 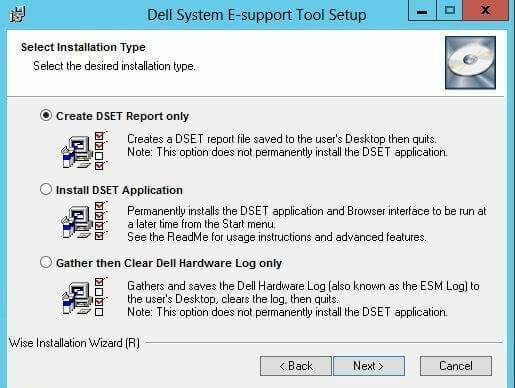 If you are not familiar with Dset, you can download it from the Dell Support site. It’s a nifty utility that provides configuration and diagnostic information for Dell’s technical support staff. I like it because I can have someone run it on a remote server and email me the report. It’s very helpful when trying to determine if a hardware failure has occurred (or is occurring). Dell Server E-Support Tool (DSET) provides the ability to collect hardware, storage and operating system information of a Dell PowerEdge or PowerVault server. This information is consolidated into a single “System Configuration Report” that can be useful for troubleshooting or inventory collection of a system. The browser user interface provides a convenient means to view specific data through hierarchical menu trees. DSET is intended to be a small, non-intrusive tool that does not require a reboot of the system to provide full functionality. DSET can collect information about Linux modules, services, network settings, etc. as well as system logs. DSET will also collect extended hardware information such as processors, memory, PCI cards, ESM log, BIOS/firmware versions and system health (fan/voltage levels) as well as storage configuration information (RAID controllers, hard drives).